Independent art licensing website for British wildlife illustrations. License beautifully vivid British wildlife illustrations and designs your clients will love. Welcome to our independent art licensing website. All are available in their original form or as a modified design for short or long term licensing. License beautifully vivid British wildlife illustrations your clients will love. Our collection of British wildlife illustrations spans over a thousand different plant, animal and fungi species – each brought to life through the talented brush strokes of Lynette Merrick, available for short or long term licensing. Lynette Merrick may be considered a veteran of the ecological industry. Her professional life was defined by her role as a teacher and a field studies officer, with four decades involved in primary science education, where she was inspired by both the natural world, and the challenges of teaching the smallest of minds about the tiny insects, invertebrates and bugs that call our woodlands, gardens and parks their home. Lynette’s professional life has run naturally alongside her role as an ecologist and wildlife illustrator. Her collection of British wildlife illustrations were developed and designed to produce field study identification guides, which Lynette sells via Gatekeeper Educational Ltd. She remains actively involved in ecological education and provides workshops and teacher training days for The Association for Science Education and Colleges. Where will you find our work? 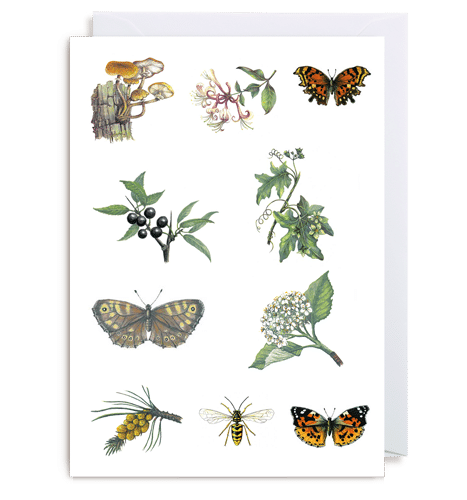 We have been delighted to provide Kew Gardens and Wakehurst Place with a range of greetings cards featuring a number of our British wildlife illustrations. This product line have proven to be popular, that the range has now been extended to include a British Bug Box and a number of Bug Posters, all sold direct to retailers via our website www.wonderfulwildlife.org. They can also be found on Gatekeeper Identification Guides, the original source of all of the illustrations, which have sold extensively across schools and outdoor organisations. Why license our UK wildlife images? Our illustrations are incredibly versatile, enhancing the products that they grace, providing additional appeal, making them more desirable and even more collectable. Our images bring to life every corner of the natural world, illustrating insects, animals, plants and fungi species from across the British Isles. Their versatility ensures they look great in a variety of styles from naturalistic to repeat patterns in Andy Warhol styled pop images. Whatever the effect that you are looking to achieve, we can help. If you have special requests for images not in our collection then we can often create bespoke illustrations just for your brand. Simply ask for details. We can also provide high-resolution images for large format printing. Our in-house design service frees our clients from restrictions, and we’re able to create endless variations of our illustrations and more contemporary and graphic designs. If you have products that would benefit from our British wildlife illustrations then do get in touch – we can tailor our illustrations around your needs, target market and product lines.